After the JavaOne ‘DJ video’ (which was also shown on Sunday at the keynote), Intel (who are sponsors of JavaOne) talked about how they were moving Java forward especially in the areas of big data, Hadoop and performance. We were shown several marketing videos – key takeaways are that Intel says Java is faster, especially on encrypted data. 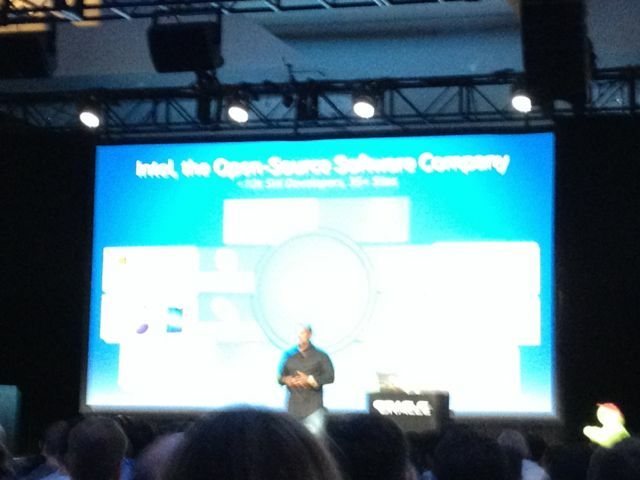 Really exciting is the announcement that Intel is joining OpenJDK. They are hoping to improve performance in Maths and on big data. Intel have 10,000 developers in total at 35 sites working on their various software projects. Intel also talked about the rise of scripting/interpreted languages which they want to run as fast as possible on Intel platforms. Several developers came on stage to talk about technical optimizations including using Xeon specific op-codes in JVM to speed up startup, working to reduce contention on threads ,and moving beyond benchmarks to use case to find optimisations. To finish, Intel talked about the work they had been doing with the Michael J Fox Foundation for Parkinson’s disease on using technology to help with researching and curing Parkinson’s disease. Wearable technology makes it much easier for research, monitor for research as well as help and deliver solutions. Mark Reinhold and Brian Goetz ran out of time on sunday so they finished the talk taking Java forward for another 20 years. He summarised why Java had succeeded (developer productivity and solved developer problems). It is Blue collar language for the real world and solving real problems… Brian Goetz talked in detail in lambda expressions. Lambda is all about making code more readable and easier to abstract so closer to problem than code implementation. – Scale on large systems. Project jigsaw will help with this. Charlie Nutter, Brian Oliver, John Rose and James Gosling came on stage to talk about the future with a question and Answer session. James Gosling does not regret adding null pointers to Java! (alternatives worse). James also said features had not been added at certain times because if they did not have a right answer, they would wait rather than add a bad solution. Brian said Lambda are more than synaptic shortcuts for inner classes. Took chance to simplify and improve performance. Rarefied generics are a common question but not priority. JavaEE will not only pick up SE/ME 8 changes and build on EE7. Enabling ease of use for both developers and end users will be a big area of interest. 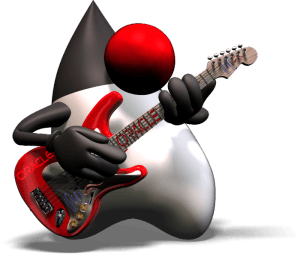 No plans to put JDK on Git. Multi-language support used not just by Charlie in JRuby but many other projects including GE’s mapping language and Scala. invokeDynamic (which provides a general feature for languages) has proved very flexible and useful. James Gosling likes default methods on interface. Much of success of Java due to IDE’s (Mark Reinhold obviously uses Emacs). Tools have improved Java and Java has improved tools. James Gosling’s favourite feature in NetBeans is green box which appears top right when all working. When will Java/VM become obsolete? Java is still growing. James Gosling has been predicting demise for decades but Java has critical mass, community and growing. And it scales. James Weaver drew attention in his talk to the large number of new and international attendees at JavaOne. He highlighted some projects including Parleys which will host recordings of all sessions if you missed them (and there were a lot of really good ones clashing with each other). Scott Sue talked about JavaFX in Celer and why JavaFX was a good fit. Johan Vos and Niklas Therning showed JavaFX running on Android and IPad. You can put JavaFX apps on the Apps store for IPad (http://javafxports.org). Lodgoon and RoboVM working to bring Java8 to Android and iOS. Jeff Martin from ReportMill showed SnapCode (free IDE for kids using JavaFX). Alison Berbenwick Miller talked about Oracle Academy’s efforts to advance Java programming with Devox4Kids. BlueJ now runs directly on Pi (3.14 release naturally). Tori Wieldt and Yolande Poirier mentioned the Duke’s choice winners and the IoT challenges winners (who came up on stage). Lots of hacking went on at the hackerthon at the show. Paul Perrone talked about using Java for testing with robots to build safer cars. Lastly James Gosling came onstage to talk about the start of Java and how it has come full-circle in many ways. Java actually started in 1990, looking at solving problems for embedded devices for IoT. Did you know Duke was originally called Fang? So with IoT, Java back to where it all began. The session finished with lots of t-shirts being thrown (or launched) into the audience. JavaOne is over for another Year! What’s in store for 2015….